If you use Gmail for sending bulk emails, you face a typical problem — the list of recipients is visible to every recipient. To eliminate it, you can either use a Blind Carbon Copy or what you really need may be a specialized service. BCC stands for blind carbon copy. This field is placed right under "To" in Gmail. All the email addresses you enter here are hidden from the recipients and they will read an email copy. Still, you have to enter something in the "To" field. Seems attractive and pretty easy, right? But don't hurry to test the waters. Gmail is not created for sending bulk emails and combats spam. Hence, there are certain limitations. Check out Gmail guidelines for bulk email senders. Email sending limit. As mentioned above, Gmail strictly suppresses sending spam. To have the situation under control, the ESP allows to send 500 emails per 24 hours. So, if you send 1 email to 500 recipients, you instantly hit the Gmail limit and you won't be able to get your message through at all if you have even more recipients. Discover the details here. Personalization. Personalization seems to be such an every-day marketing instrument that only a lazy doesn't use it. Still, using BCC, you can’t send relevant content to each recipient. 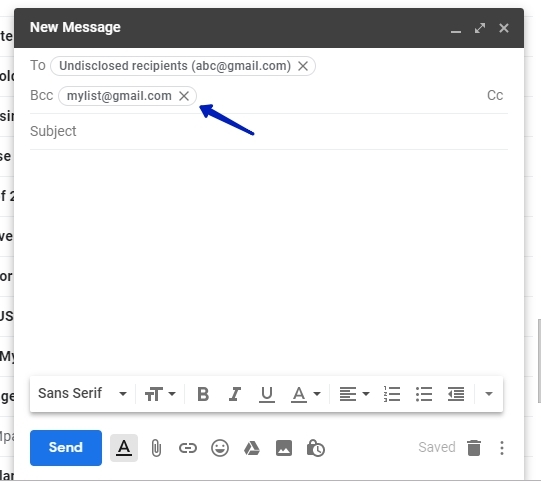 On the contrast, email services allow to personalize both the subject line and the email content using personal information about the recipients. No detailed stats. Gmail doesn’t provide users with detailed email performance reports. On the contrast, email services allow to find out how many of the recipients opened or read your email, how many of them clicked the link, etc. 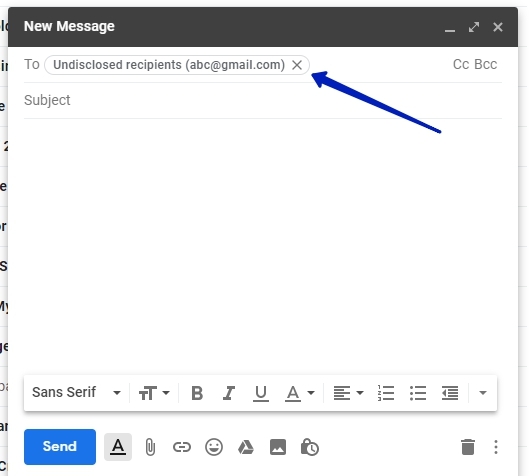 Absense of email template functionality. If you send bulk emails regularly, you know that it's quite a tedious task to craft an email template. Moreover, Gmail doesn't provide its users with pre-designed templates. The only way out is the Canned Response feature. On the contrast, most email platforms have ready-made email templates grouped by industries. So, the users don't need to create one from scratch or have HTML knowledge. In addition to the limitations mentioned above, Gmail doesn’t offer useful instruments for professional marketers. That’s why the best way to send bulk email without showing all addresses is via an email service. SendPulse is an email marketing platform which is more useful for online businesses than for private correspondence. It helps promote a brand, establish relationships with the clients and boost ROI for free. No email sending limits. Email services offer pricing plans that depend on the number of recipients on your list. Most of them have free plans or trials for small business owners. SendPulse allows to email up to 2,500 subscribers totally for free. Personalization. This instrument helps collect additional information about your recipients, such as gender, age, date of birth, company, the position occupied. Hence, each recipient gets a personalized email. Segmentation. It allows to create segments based on the data you have about the recipients and their interaction with your brand. As a result, they will receive relevant and valuable content. Pre-designed email templates. Email services have galleries of ready-made templates suitable for any industry. There’s no need to have special skills to create a professional email template. Detailed email analytics. You can discover how many recipients opened and read your emails, clicked the links inside of it, marked an email as spam. These reports help to get insights into your email marketing strategy performance and correct it on the go. You don’t have to trouble yourself with this question when sending through an email service. The list of recipients is hidden from subscribers and you are a righteous marketer. After the registration in SendPulse, you can create a campaign and send it for free. Rate this article about "How to send emails to multiple recipients without them knowing?"